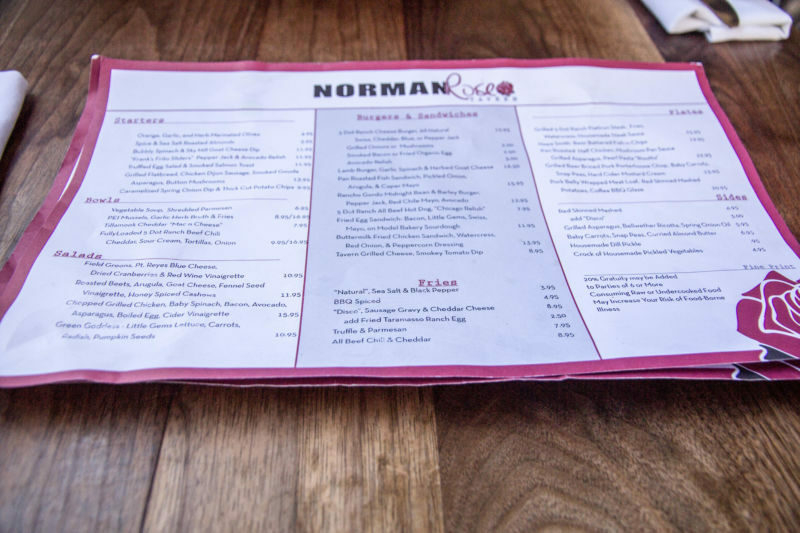 The Norman Rose Tavern sits on First Street in Napa. We stopped in for lunch before a recent trip to Luna. It was a perfect day for al fresco dinning; warm, but not sweltering with a nice breeze. We took advantage of the weather to sit outside on their covered patio. 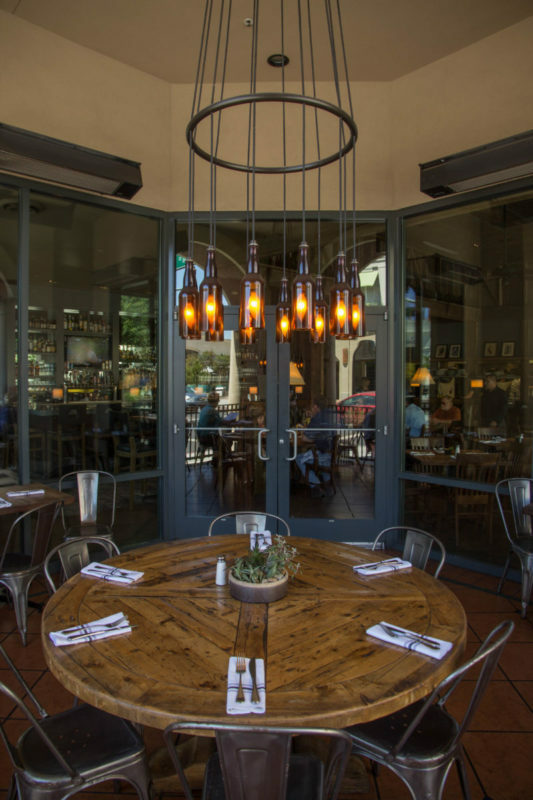 This outside space consists of a set of small tables arranged around a single large table, with a chandelier whose bulbs sat inside brown beer-bottles. California Girl Comments: What a beautiful day and a beautiful restaurant. I have been excited to eat at this new place as I have been following them on twitter and Instagram for weeks and have been drooling over all of their food. When trying to describe the restaurant, I can’t tell you what the exact style the interior is. I think they were going for an homage to an English Pub but with a twist. Still it was lovely and interesting. The bar area was really pretty. It was too nice to sit inside so we chose to sit outside on the patio. The chairs lacked padding and appear to have been designed by someone who has never seen the modern American posterior. Our server brought us a wine menu, a drinks menu, and two copies of the lunch menu. This latter document was a single sheet of paper, which was somewhat crumpled; in sharp contrast to the leather-bound beverage menus. California Girl Comments: Being handed crumpled, stained menus wasn’t a good start for me. Just yuck. Also after a few minutes my bottom started to ache in the uncomfortable chairs that were placed on the patio. 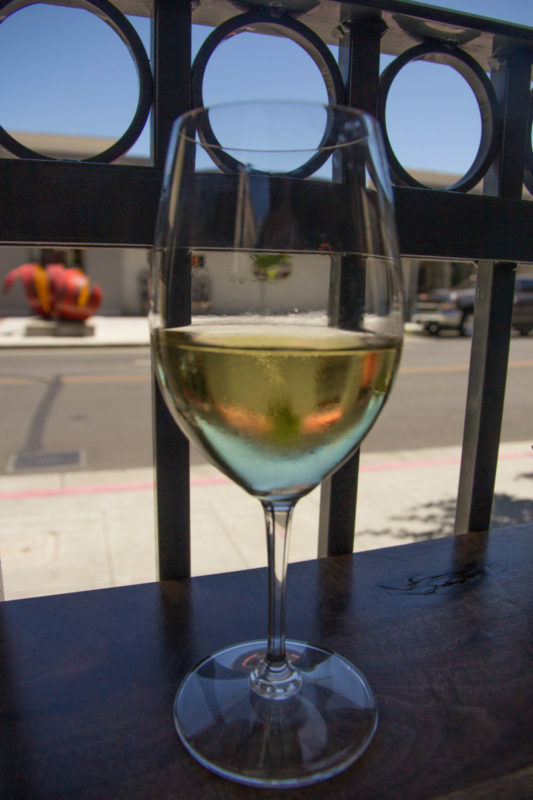 I ordered a glass of the Brainchild, a California expression of the Vermentino grape. California Girl asked for an iced-tea with no lemon. I ordered Fish and Chips and she went with the shrimp salad. The wine was a rich yellow colour. It offered melon, honey, and pear on the nose. When served, it was over chilled, as a result my initial taste detected just the high acidity. Over the course of the meal as the wine reached the correct temperature, I tasted gooseberry and a hint of smoke in a refreshing light-medium body wine. An excellent choice for the warm day. 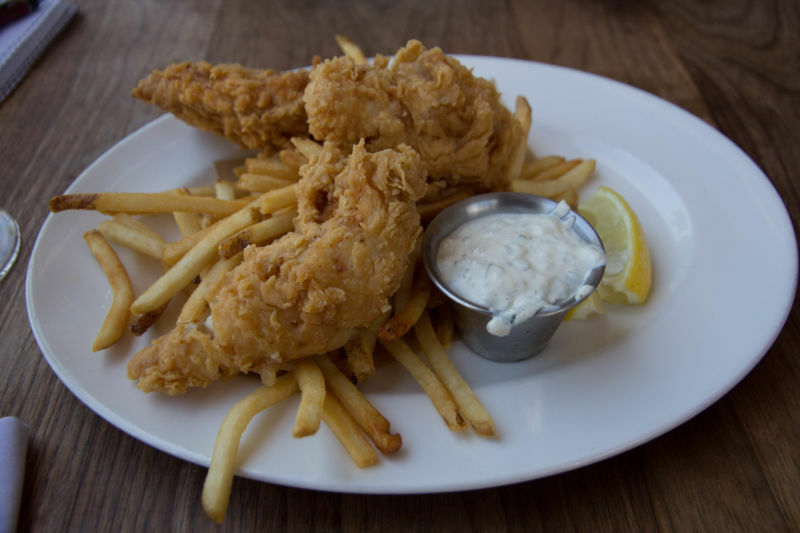 The fish and chips arrived and I was disappointed to see string fries and not the English style chips that this meal needs. The batter had a great texture and it was not overly heavily, but it lacked seasoning. The fries were over-salted, so on average the level of seasoning may have been correct, but unfortunately culinary arts do not work in such a neat mathematical manner. The fish itself was excellent; meaty, flaky, and cooked to perfection. California Girl Comments: When I ordered my shrimp salad the waiter went into detail about its preparation including its dressing. A Lime Jalapeno dressing. 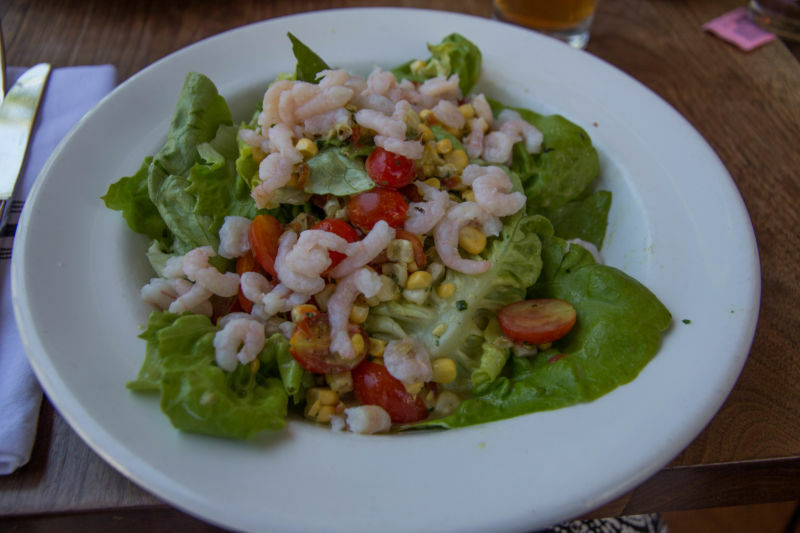 The salad was to include tortilla strips, tomato, corn, onions butter lettuce and shrimp. You are getting the whole Mexican vibe here right? Me too. However, what arrived was: A sweet dressing with absolutely no Jalapeno, a hint maybe of lime, no tortilla strips baby unflavored shrimp, sweet corn no onions nothing. This was not at all the salad that was described. It was a mouth full of sweet no spice to be found. On the upside, every single ingredient was fresh and crisp. The waiter did very kindly bring me the tortilla strips but they were under salted and just tasted blah with the sickly sweet salad. It really wasn’t the waiter’s fault. He was simply relaying the information he was given by the kitchen. He really did try to be efficient and fix the situation as best as he could. When I looked at The Brit’s food it looked really good. The fish especially made me excited to take a bite. That was until it hit my mouth and I got a bunch of bland coating. I am not someone who loves salt but dang! I was ready to reach for the salt-cellar in this case. Even the tartar sauce which was average in flavor couldn’t help it. The good news however is that the fish was cooked beautifully and it was very tender. I think someone simply forgot to season the batter. I also was disappointed with the presentation. It looked as though someone just slopped it onto the plate. There were fries hanging off, and there was tartar sauce dripping off the side of the cup that held it. The service was attentive, the ambience pleasant, but the food disappointed. Given the wealth of other options in Napa, I doubt that we shall return. 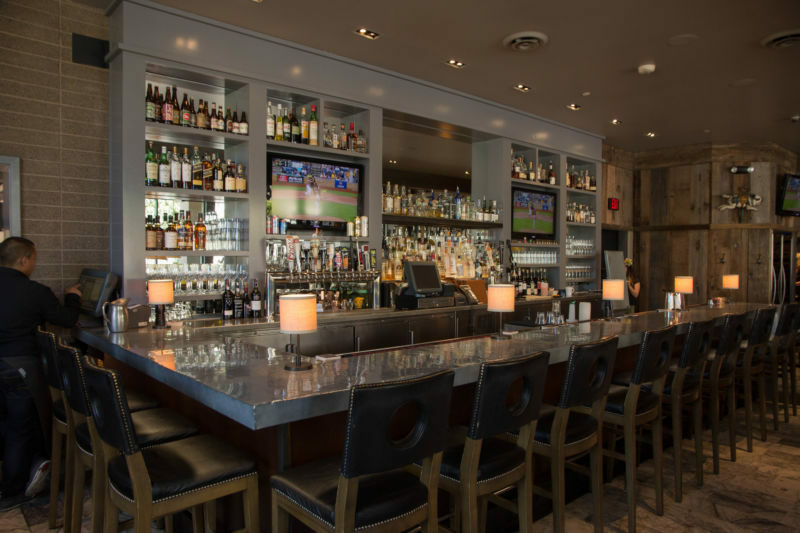 California Girl Comments: Here is the thing; this is a nice well-appointed restaurant in a great location that obviously uses quality and fresh food. The service seems pretty good for the most part, but they seem to have an issue in the kitchen with detail. You can’t do that in Napa and expect to stay in business as its so competitive here. Sadly, I have to give this place a needs improvement rating. 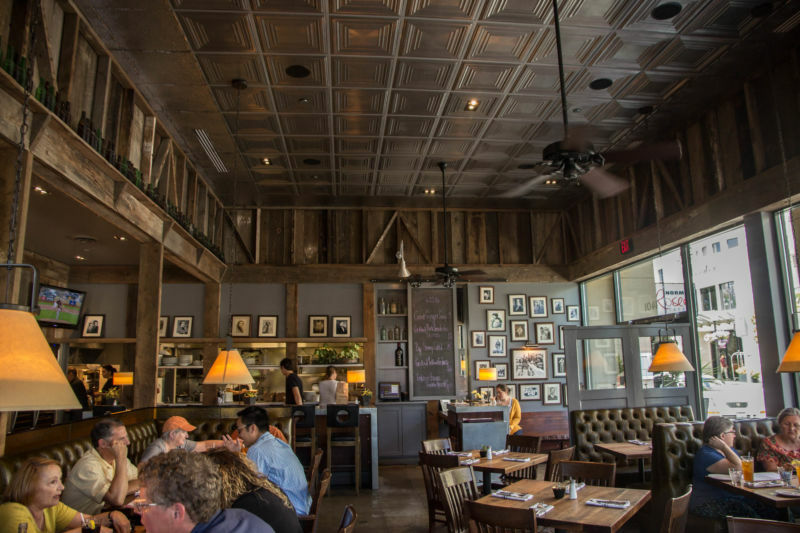 Pingback: Market Restaurant, Saint Helena, Ca.